#stampinup #faithfulinkspirations I received this awesome card in a swap at my upline's Holiday Catalog gathering. It was made by Davona Palmer. It's stunning--and there is NO stamping. It uses a textured embossing folder and several thinlits/framelits. Let's see how Davona made this beauty! Davona started with a Crumb Cake Card Stock card base. She added a 5-1/2" by 3-3/4" strip of Early Espresso Card Stock. Next, she embossed a 5-1/2" by 3" strip of Cherry Cobbler Card Stock with the Holly Embossing Folder and adhered that to the card. Then Davona cut a piece of Very Vanilla Card Stock with one of the Lots of Labels Framelits. She sponged the edges of this piece with Early Espresso Ink to give it some "age." She used the Pretty Pines Thinlits Dies to cut the three pine needle sprays from Emerald Envy Card stock and the three pine cones from the gorgeous Copper Foil Sheets. 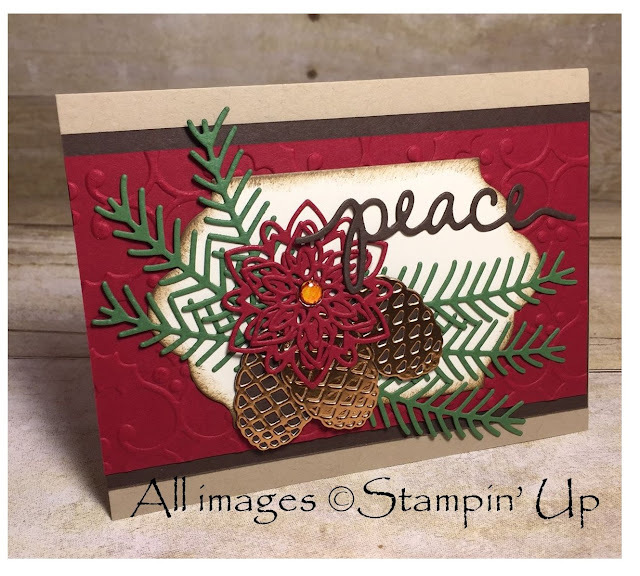 Davona used the Flourish Framelits to cut the flower from Cherry Cobbler Card Stock and the Christmas Greetings Thinlits to cut the word "peace" from Early Espresso Card Stock. She arranged all the elements and adhered them to the top of the Very Vanilla label. For a final bit of bling, Davona added a Gold Metallic Enamel Shape to the center of the flower. Isn't this just gorgeous with all the layers and textures?! I'm so glad to have received this card in the swap!! I have one more card to share tomorrow that uses the "Peaceful Pines" and Pretty Pines Thinlits Bundle. Come back and see what I have in store for you!